April's Wine of the Month! Sign up. Earn Points. Get Rewards. It's never been more rewarding to enjoy Missouri wine. Check here for our awards program and other information on becoming a Missouri Wines MVP today! We have everything from dry to sweet and from white to red, so you will always be able to find one that fits your taste perfectly. Our winemaker has been producing fine wines for more than 30 years. 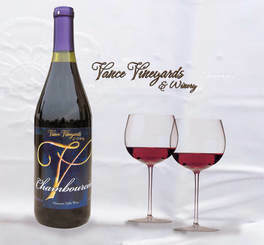 His skill and experience ensure every bottle is worthy of the Vance Vineyards label. Dry Traminette- Has a very floral nose and flavors of rose and citrus flowers with a hint of spice. Semi-Dry Traminette - This light, bright wine has floral hints and a mouth filling finish. Simply Karen - Aromas of citrus and tropical fruits in this versatile wine makes it perfect for any occasion. Dry Chardonel - Light, crisp, dry, with aromas of citrus & pineapple. Simply Karen - Aromas of citrus & tropical fruits in this versatile wine makes it perfect for any occasion. Vignoles - 2011 Vignoles released August 11, 2013. This is our first Vignoles vintage. Loaded with aromas of pineapple, peach, with a hint of honey that fills your nose and your mouth. The finish is long and the crisp acidity leaves you wanting more! Barrel Select Chardonel - Full-bodied, aged in mixed oak for 12 months; hints of pear and vanilla, with a long, smooth finish. Mollie - Wonderfully soft with notes of cherry; hints of pepper & spice with a barely-there oak finish. 2007 Chambourcin - Lots of wild cherry enhanced by brief contact with oak; subtle hints of star anise & chocolate. Aviator - Fruit forward with hints of cherry and black currant over a spicy aromatic background. The firm tannin structure is well balanced and gives a clean crisp finish. 2010 Norton - A smooth, rich wine with cherry, blackberry and slight peppery flavors. Our Norton is smoother than most Norton wines. 2010 Estate Norton - Classic, robust, mouth-filling, bursting with flavors of blackberry & cherry. Peppery notes with vanilla aromatics. Aged 18 months in oak. Muscat - Aromas of luscious ripe peaches & pears with spicy floral notes. Sweet Dreams - Wonderfully sweet, full bodied, with notes of peach & honey. Blush - A palate pleasing light bodied, semi-sweet wine with hints of peach. Catawba - A delightfully flavorful pink wine with the subtle sweetness of the famous Catawba grape. Sweetie Pie - Flavors of raspberries & cherries, aromatic & full flavored. For the young-at-heart. Lavishly Late Harvest 375ml - Full-bodied with lavishly rich flavors of apple, honey and apricot flood your palette. Late Harvest Chambourcin 375ml -Aromas of peaches, apricots, raspberries and subtle cherry develop into luxurious vanilla and caramel. Export Harbour 375ml -A Port-style wine with a richer, sweeter taste. 5 complimentary wine tastings, $1.00 for each one thereafter. Beer is also available as well as a full bar.